As I’ve been working on the upcoming redesign for our Nicolin Mansion website, one page I wanted to expand was our original Attractions page. The information was helpful to our guests, but as more attractions came to Jordan I saw our single page getting overwhelming and hard to use. I began to envision a tourism site showcasing all that Jordan has to offer our visitors. I took photos, and expanded the information on each attraction from my original page, and a Jordan tourism site evolved. 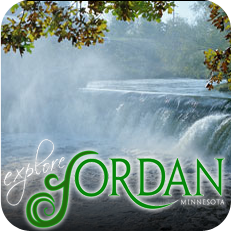 I still need to add some more content, and get a fabulous new logo, but I felt the first draft was finalized enough to go live at ExploreJordanMN.com! The site is still evolving, but wanted to give our readers a sneek peek. Hope you like it! A Saturday afternoon, interrupted I thought, turns into an unexpected unforgettable moment. A drive from Jordan to Maple Lake. Actually 90 moments there. And 90 back. Same estimated time freeway or back way…so back way it is. And leaving Jordan we have no idea what we are in store for. So a couple stops, and three times back home for the forgotten item, we head on down the highway. Turns out to be the Hoarfrost Highway! Origin: 1250–1300; Middle English hor-frost. One great thing is the rule for this ride: No iPod. No cell phone. Just talking. It’s me, and my teenage son. Turns out we never even turned on the radio. So I have him grab the camera that I brought along (indented to take photos at the New Prague Library’s Historical Society Exhibit that I was planning on visiting when I get back to town). And as we roam on down the highway, he snaps the photos. And along the way we talk! After about 50 photos he says to me, “Can I stop taking pictures. And just experience the beauty?” Yes, my THIRTEEN YEAR OLD BOY says those words! It must be incredible scenery!! So as we continue the ride… we share stories. Places we want to visit. Ghost story shows we’ve seen. His are better (scarier that is!) than mine. Great! I’m on my own for the return trip home. For the return trip, I make many stops along the side of the road to take some close-ups of this frost. With so much surface on the frost, the light really has a lot of area to reflect light. Even on this overcast day, with only small moments of sun glowing through the haze. You can really see the frost protruding like needles. And after all this detail, I stop to see the forest through the trees. The large vision is gorgeous! And then my camera tells me: “Battery exhausted.” It’s done a fine job, over 100 photos hoping for that great one. And it’s done. And as I drive past that forest, the hoarfrost is done as well. It lasted all afternoon, but only out on that drive. From town I had no idea what was waiting to be experienced on the road. Jordan attracts the antique seeker, and the antique dealer. Our latest addition is The Jordan Junker, and it certainly will not disappoint the antique enthusiast. The shop is open as an occasional sale store, open posted days during the month with a constantly changing inventory. During my visit in December, a focus on holiday decor and gift giving was a feature. There are eye-catching treasures around ever corner in this shop. You Just Might Find the Perfect Find! I set up a vintage tree in our middle parlor bay window, complete with vintage ornaments and bubble lights. These vintage wreaths were the perfect addition! Two of these went home with me. I Just Could Not Leave the Store Without This Wreath (or Two)! They look awesome in our middle parlor. Just might not be able to see them from the front street…a venture into the winter courtyard might be needed. Finds from The Jordan Junker Find a New Home! Be sure to watch their website and Facebook page for the schedule of their open dates. Update 1/18/12: The Jordan Junker has MOVED to a larger space! The new location is at 236 Water Street on the West side, in the same building as Tri City Cellars (formerly Water Street Antiques). NOW OPEN EVERY DAY (access store through Tri City’s entrance) with special events planned by the “Junker” monthly! The Jordan Junker will be open for business at the new location starting Wednesday, January 18th @ 10 am with a Grand Reopening Sale planned for March 9th. Update: The Jordan Junker has MOVED again, into yet another larger building at 206 Broadway Street South – across the street from the Nicolin Mansion. Check their website for store hours. While watching Jordan’s local Heimatfest Parade Saturday morning from Nicolin Mansion’s front porch, I turn to our innsitter, Cindy Nevins, and make an offer: you clean the room that’s checking in this afternoon while I finish my computer work and we’ll go on a Nicolin Mansion Fieldtrip to Crofut Winery for the annual Grape Stomp. Deal! So we finish our jobs and head to the winery, about 7 miles from the inn. The parking area has been updated since the last time I visited (I haven’t been since last season…) which was very nice and easily handles a lot more cars. Nicolin Mansion pays for admission ($5), it’s a working fieldtrip of course, and off we go. First we see our Chamberlin guests we just checked in, and I catch Rob just as he’s about to take a picture of Kat – alone – in the grape bunch face-in-the-hole picture spot, and offer to take their picture together. He was seconds away of getting out of that one, but as an innkeeper, I’m always ready to help out whenever I can. Just to keep it fair, Cindy and I both posed for our own face-in-the-hole pictures. Our first stop, wine tasting – it’s a grape stomp, it’s all about the wine, right? So we join a tasting table to taste them all and pick our Wine du Jour. They are sampling 6 wines today. Today’s temperature hit about 90, so the whites were refreshing even though I tend to be a red wine gal. We were joined by another friend from Jordan, and chose the Prairie Blanc for our wine of the day. We head into the barn that serves as the usual tasting room and gift shop to buy our bottle of wine. There’s also this fabulous iron piece outside the door that I’m convinced would fit perfectly in our courtyard, but of course it’s not for sale. This belongs in the Nicolin Mansion Courtyard! After purchasing our bottle, we were off to the arts and crafts tent. The artists’ selections are great: from jewelry to outdoor art, from candle holders to wine holders, the creativity is terrific! Hands-free Wine Glass ~ A Must Have! But this is the Grape Stomp after all, so we find ourselves a table under the tent and sit down with our wine and a cheese plate to enjoy the festivities. Finally reaching full grape assult! A definite must-see event! Stomping spots are snatched up pretty quickly, so reserve your spot early. If you miss getting to stomp, it’s definitely still worth it to stay, sip some wine, and see the stompers in action! I like to set goals for renovation projects, now that we’re open, specifically on dates for upcoming events. So when we booked a recent courtyard wedding (watch for a future post), I set the goal, well actually Kevin’s goal, to have the only yet untouched room in the mansion completed for that wedding. So when “we” renovate a room, that means I design and buy, and Kevin makes it happen, and I come back and put on the finishing touches. I’ve called it “our dance” – he says it’s more like mud wrestling. So I bought, and he made it happen, and I compromised along the way when the room called it’s own shots (which happens any time you open up the walls in one of these old houses). Turns out we finished, just barely, on time. And the wedding guests were able to use that only bathroom not connected to a guest room. Must have seen a hundred-plus trips from the courtyard to the Breeggemann that day (one guest even suggested a Biffy – now that would have spoiled all my plans for a remodel! ).